from 1963's Jason and the Argonauts. For no reason that I can determine at all, late last night I found myself thinking about Ray Harryhausen. Maybe it was because I caught the original Clash of the Titans a week or so ago and not for the first or last time, found myself marveling at the stop-motion magic that this man wrought over the course of his long, long career. It occurred to me that if and when he passed, I was going to have an awful hard time choosing one photo that best conveyed Harryhausen's spirit, his ingenuity and his passion. But that hopefully, Lord willing, that day was going to be a long, long time to come. Instead here it is less than twelve hours later and I'm having to do just that. Clash of the Titans is what introduced me to Ray Harryhausen's work, and I'm always going to consider Medusa and how he brought her to life as his most terrifying creation. But that's such a classic image of him doing one of the skeletons from Jason and the Argonauts that, it had to be that one. It had to be a photo of him doing what he did best: making us believes that there really were monsters and other incredible creatures up there on the big screen. From 1949's Mighty Joe Young on through 20 Million Miles to Earth, Jason and the Argonauts and many other legendary science-fiction and fantasy films, Harryhausen pulled off nothing short of magic... or pretty dang close to it. This was a man without whom, there would likely have been no blockbuster movies as we have come to know and love them. 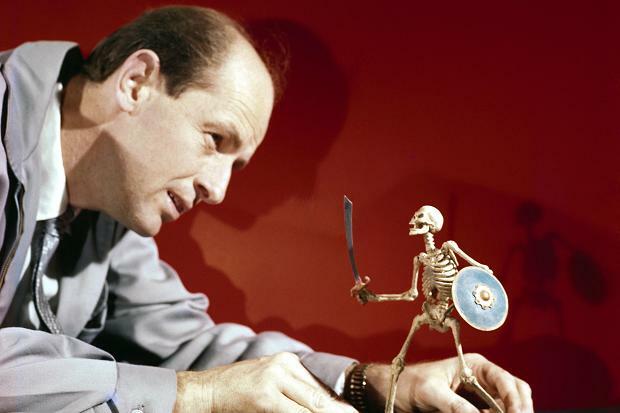 Harryhausen was a special and visual effects maestro who forever left his mark on cinema. Without his pioneering work, there may have never been a Star Wars series. George Lucas himself remarked as much earlier today. This afternoon the sad word has come that Ray Harryhausen has passed away at the age of 93. My heart was heavy when I learned that this great artist was no longer with us. Harryhausen's death is an incalculable loss to world cinema. I revere him.